This is a one of a kind 4 bedroom, 4 bathroom Mirage condo (with a garage), on the back row with plenty of privacy! Home has recently had a complete exterior makeover with the exterior being completely removed and replaced with new hardy plank, trek trim, trek decking and a new roof (over $90,000 in total repairs), making it virtually maintenance free. On the lower level there is a bedroom (Duo bunk with trundle), full bath, access to the outside patio, a washer and dryer and access to the garage (garage door opener) which has plenty of space for secured storage and the outside shower. The second floor has two master bedrooms (King and Queen), one with a large jet tub and deck access. The top level offers a large kitchen, great room, deck access, dining area, bedroom (twin beds) and full bath. One more thing, there are 4 owners' closets for plenty of storage and a new 80 gallon stainless steel hot water heater was just added this year. Two remote thermostats were installed last year in the house (about $450). 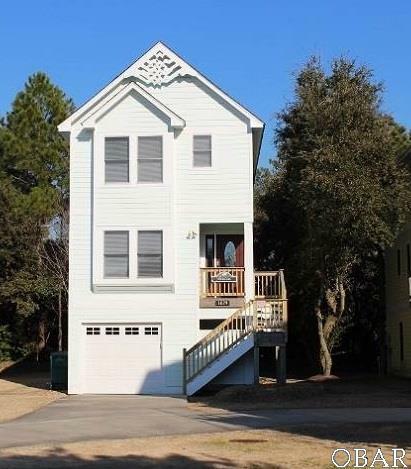 Please come take a look at this well maintained home when you are visiting Corolla Light, you won't be disappointed! !